Rava Ladoo is a simple, easy to make and classic sweet. It is prepared during any occasion or just as a sweet snack for eating during the evenings. Since it is easy to make with just few ingredients, i usually prepare Rava ladoo when i want to eat something sweet. It is one of the first few sweets that i learnt to prepare at initial stages of cooking. Rava ladoo is usually prepared during Diwali and or Gokulashatami festival. The texture of the Rava ladoo could be slightly coarse or completely smooth without showing any grainy texture of rava. It depends upon each one’s personal tastes. In a pan, add ghee and fry the cashews until golden brown and keep aside. In the same pan, dry roast the rava by constantly stirring with a laddle until a nice aroma of cooked rava wafts. But take care not to brown the rava. Once done, remove from flame, keep aside and allow the rava to cool completely. In a dry mixer, powder the sugar into a fine powder and keep aside. Then in the same dry mixer, powder the semolina into a fine powder or lightly coarse. Transfer the powdered sugar and semolina into a wide bottomed bowl and mix until both are combined well. Then add the cardamom powder and ghee fried cashews. Heat up a little ghee and add it as well. Mix everything together with your hand. Now the mixture will look like bread crumbs. But quickly with your hands, form them into round balls by pressing tight. And Rava ladoo is ready to be served and just Relish! This Rava Ladoo made with ghee stays good for a week. Avoid refrigerating the Rava Ladoo. Consume it as such or you can store the ladoo’s for 3 to 4 days in a air-tight box. While roasting the rava, constantly stir with a laddle to avoid browning of rava. Otherwise the rava at the bottom of the pan will get browned and may affect the taste and color. While combining the powdered sugar and semolina, mix thoroughly so that the sugar is evenly coated on all the sides. If the mixture gets dried, add few drops of ghee as and when needed to form it into balls. Optionally, milk may also be used to form balls of rava ladoo, but the shelf life will be very less (1 or 2 days) as compared to rava ladoos made with ghee. So consume it within a day. Even desicated coconut gratings can be used. Thank you Dimple. Yes, they were really yummm!! Easy to make and oh, so delicious! Thank you Tanusree 🙂 Sure, i will send across some!! I have not made this in ages. 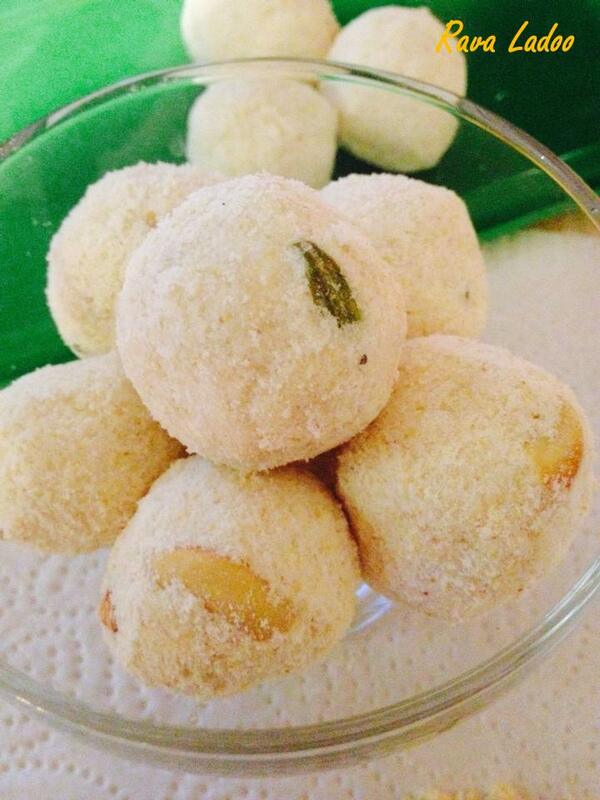 These ladoos look gorgeous…am making them today! Thank you 🙂 Yes, they were indeed delicious.